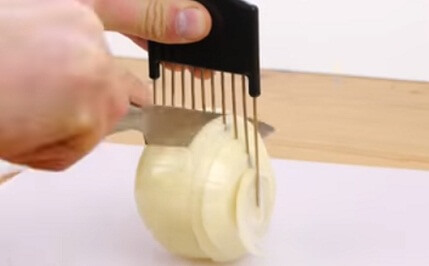 Best way to cut onion Today, I’m gonna show you a really cool way to make slicing an onion, really simple. 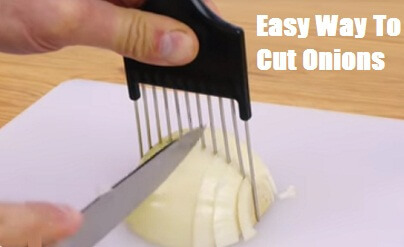 Sometimes when you’re trying to cut an onion, it all breaks apart as you’re cutting it And you have to use the knife very close to your fingers But I’m gonna show you how you can use a hair pick like this, to make your life easier. first when you decide to buy your onion cutting tool Make sure it’s nice and strong with stainless steel prongs. Place your onion on a chopping board Chop off both ends And peel as normal. If you want to cut your onion and make onion rings, stand it on it’s end, and push the hair pick straight through the middle of it like this. Then take your knife and cut in between each prong. 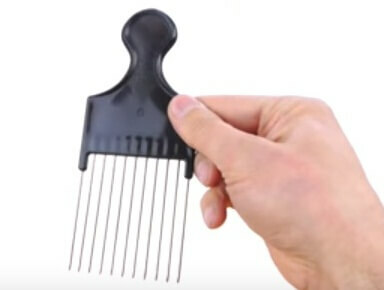 The hair pick will keep it all together and give you nice even slices. Slide the onion off. And you can open them out into rings! If you want to dice your onion; slide the pick into one half And do exactly the same again. 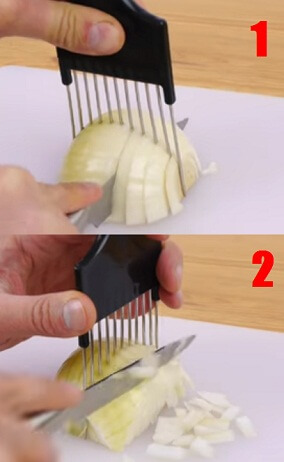 The hair clip will keep it nicely together and keep it all nice and neat when you cut the onion.Turn it 90 degrees without removing the hair clip and start slicing again and there you have it a perfectly diced onion. It’s a really useful tool. 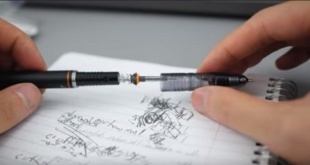 And it makes things safer too because you don’t get your fingers anywhere near the knife blade. Pretty cool, huh?. You can also use it for other fruit and veg to help give you nice, even slices. It works really well with tomatoes and almost all vegetables in your refrigerator . You could spread out the slices for a nice salad. Or they’re perfect for making sandwiches. And if you’re making drinks for a party and want to add a slice of lemon Using one of these to help you out makes it really easy. I hope you’ve enjoyed this kitchen tip, if you want to see more you can click on the other posts on the top right of the website and don’t forget to share this with your friends also take a look at our main website best10for.com to find out the latest tips , tricks and best 10 lists. Stay safe, have fun.